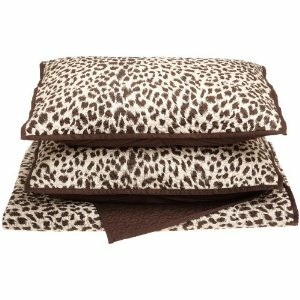 Restful hand-crafted quilt ensemble in subtle Cheetah print gives the finishing touch to your room decor. 100% cotton sateen, 300 thread count, 3-piece Quilt set, cheetah animal print design reversing to a solid, fabric is calendared and mercerized for long lasting comfort and quality, Quilt pattern is a vermacelli stitch and has a solid tape binding; Black/White colorway is sure to enhance any room; F/Q: Quilt 90″ x 90″, Sham(2) 26″ x 20″. For image details, click “Buy Now”. Available in Twin, Queen and King.